March 03: It‚Äôs 31 Days of Free Music month at Podcasting News. Every day in March, we‚Äôre going to do our best to hook you up a great free music podcast. Previously, we’ve highlighted a free electronic music podcast and a classical music podcast. Both of these podcasts are radio-show style podcasts, combining music and some discussion. Today’s podcast is a little different. Ottmar Liebert’s Listening Lounge is a podcast that is just music. 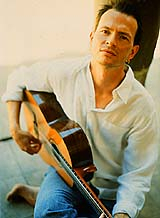 Ottmar Liebert, if you’re not familiar with him, is a German composer and guitarist, born to a Chinese-German father, and a Hungarian mother, who plays Brazillian-influenced Nouveau Flamenco. As you might guess, his work has a world music feel to it. Liebert helped pioneer the use of podcasts as a promotional tool for musicians. Early on, Liebert created his Listening Lounge podcast, which features live versions of his music, alternate takes, tracks in progress, and music by other label-mates. In other words, subscribe to Liebert’s podcast and you’ll get a regularly updated collection of free music. You can preview Liebert’s music with the track below, Bells. Find out more about Liebert at his official label site.